Gone are the days when we need to travel abroad to experience the thrill and beauty of amusement park. Holidays are here and taking your kids to the amusement park is one of the best options. There are some of the best amusement parks in India which you need to know about them. Adventure Island, New Delhi : Adventure island is the best amusement and theme park in Delhi. It is a theme park with bridges, towers, lakes, water coasters, boats and rides and greenery. Car ride is the special feature of this park. There are rides for adults, kids as well as for the entire family. Essel World, Mumbai : It is one of the oldest theme park in India. This park is constantly recreating fun. It is an exclusive water park with boats of an ice skating, thrilling rides. One of the most interesting thing of this park is Monsters in the Mist Dark Ride. It is the 4 minute ride through a tunnel which gives you a scary experience with family or friends. Wonderla, Bengaluru : It is the cleanest and greenest amusement park. The park has over 50 rides for kids as well as adults. There are also some special rides for children. Water based rides, rain disco, dance with sound and light show are best facilities of the park. Science city, Kolkata : It is one of the top amusement park in India. Visit to the park gives you a lot of learning and exploring along with lots of fun. There are various activities for you and your child like 3D theater, space theater, time machine, cable car, road train, mono cycle etc. 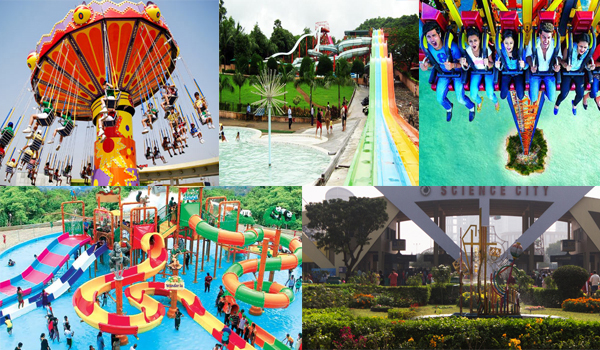 Suraj Water Park, Thane : The park is also called as pride of Maharashtra. The park is the winner of Limca Book of Records for being asia’s largest cave. The park is an amalgam of Indian mythology and water activities.